"We'll focus both on their immediate experience and on their perceptions about the long-term value," Apple retail head Angela Ahrendts said in a LinkedIn post. "We want to be as rigorous in measuring our human impact as we are in every other part of our business." Ahrendts avoided any specific details, but in the rest of her piece suggested that Today at Apple is geared toward "enriching lives," and that the company realized it needs "a new set of measurements" to gauge effectiveness and "human return on investment." The Today at Apple program is a rebranding and expansion of the events long held at Apple stores. While most of these are small-scale workshops, like Photo Walks and the Kids Hour, sessions at bigger locations can include professional artists, authors, filmmakers, photographers, and musicians. 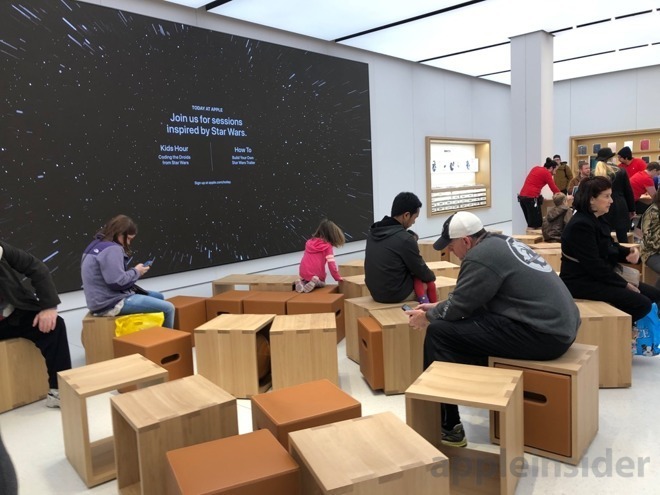 Since taking over retail Ahrendts has engaged in a massive revamp campaign, introducing not just Today at Apple but a modernized store design modeled after fashion boutiques. The executive has also tried to rechristen shops as "town squares."